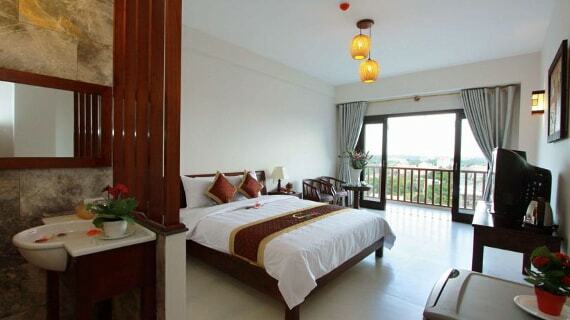 Sunshine Hoi An Hotel is located within a radius of 15 minutes from Hoi An old quarter. It is recognized the world heritage by UNESCO. 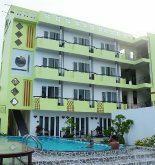 Hotel also provides the outdoor swimming pool and free wired internet for the whole building. Hotel Sunshine is distant An Bang beach 2 km, My Son sanctuary – World heritage in Vietnam – 60 km and at an hour driving distance from the Da Nang international airport. The hotel’s rooms overlook the views of garden or pool especially some selected rooms have balcony. They are also provided the satellite television, mini bar and the electric kettle. Some of them are equipped the flat screen TV. To meet demand exploring the surrounding areas o tourists, this place offers free bikes for them. The tour desk is able to arrange sightseeing of tourists as well as provide foreign currency exchange service. Especially, hotel also provides the dry cleaning. In restaurant, tourists are served the selected Asian and Western dishes. Drinks are available at the bar. Address: 02 Phan Dinh Phung St, Hoi An, Quang Nam, Vietnam. This information has been supplied by Sunshine Hoi An Hotel.